Your system may be programmed to allow a Panic alarm to be easily activated from any LCD Terminal without needing to Log on. A Panic Alarm is activated by simply pressing the [HELP] key three times in a row. When a Panic alarm is activated, the resulting action will depend on how the optional “Panic” System Inputs are programmed for each of the LCD Terminals in the system. e.g. In some sites, Panic may be required to activate local Sirens and send a report to a Computer in a local Control Room. In other sites Panic may be treated as a “Silent” system alarm with a report sent to a remote monitoring station and no local action at all. IMPORTANT NOTE: Consult your Installer to detemine if the Panic function is enabled and how it will operate in your system. Press the [HELP] key at any LCD Terminal that has the Panic option enabled. The display will prompt you to press the [HELP] key again if you want to activate the Panic alarm. Press the [HELP] key again within 10 seconds to activate the Panic alarm, OR Press the [END] key to abort if you pressed the Help key a second time accidentally. The display may show an alarm message, or may simply return to the normal display depending on how the Panic alarm is processed. Your system may be programmed to allow a Duress alarm to be activated if you are being forced to perform operations at an LCD Terminal against your will. 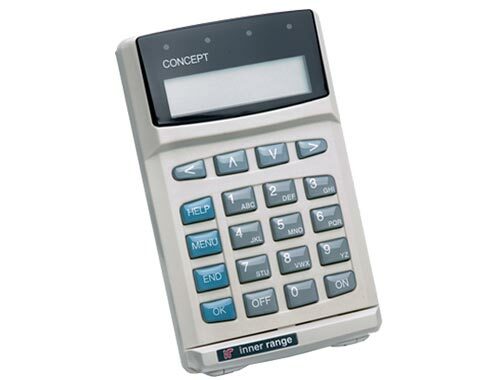 Duress is activated by simply entering a special PIN Code instead of your normal PIN Code, when logging on to the LCD Terminal. To detemine if the Duress Code function is enabled in your system. For details of any Duress Codes that will be used. For details of how the Duress Code function will operate &/or report. You may wish to use the space below to record the details of how your Duress Code system will operate. (NOTE: The Duress PIN Codes should not be recorded here). Alarm messages must be acknowledged by a User with the appropriate authority. These messages provide precise information of the type of alarm, the Area it has occurred in,and the Zone or System Input that generated the alarm. Logon to the Terminal as described before. The display will show the specific details of the Alarm and provide a scrolling message if more than 16 characters. Note alarm details, then press the [OK] key to acknowledge the message. If there are other Areas that have had an alarm, the next Area Alarm message will be displayed until all Area Alarm messages have been acknowledged. The display will then show the Area ON/OFF message to allow you to continue with your operation. e.g. Turn the Area OFF. If this message is displayed certain types of alarms in your system have been programmed to Latch. Latching alarms enables all alarms in an Area to be individually viewed when this message is displayed. Use the [UP] and [DOWN] keys to view all Latched alarms. Logon to the Terminal to acknowledge the alarm/s and clear the message. Allows a User to view the list of review events stored in the memory. This may be necessary to find out details of user activity or past alarms, etc. The Display will show the last review event, which will probably be a record of yourself accessing the Review Menu. The  key is used to go to the start of review (earliest event still stored) and the  key is used to go to the end of review (last event saved). [UP] (back) and [DOWN] (forward) Arrow keys are used to search review, one event at a time. [LEFT]: Forces display to the start of the text. [RIGHT]: Scrolls text one character at a time. The DIGIT keys, 1 to 8 can be used to search back through review for specific types of events, beginning from the date/time of the event currently displayed. As there are more than 8 filter categories that can be selected, the “Mode” can be changed by pressing the ON & OFF keys, allowing selection of more categories. You can use these filter keys in conjunction with the UP and DOWN Arrow keys to locate a specific event and then review all the other events around it in more detail. OFF = Mode 1. ON = Mode 2. MODE 1. MODE 2. Key 1 Alarms & Restorals. System messages. Key 3 Auxiliary On & Offs. Detail. Key 4 Siren On & Offs. Communications. Key 5 User operations. Lifts. LOGON to an LCD Terminal. Logging on is the first step performed in MOST operations. Enter your secret PIN Code using the digit keys,then press the [OK] key. Each digit pressed will be displayed as a hash (#) character. If you make an error while entering your PIN code, press the [END] key and start again. If there are no messages to be acknowledged, the Display may first greet and identify you. Note: Greeting can be disabled in V3 or later. If there is a message to be acknowledged, refer to “Acknowledge an Alarm”. The status of the first Area (or Area List) that you are allowed to control is displayed, with a prompt to perform an ON or OFF operation. When your operations are complete, you must Log off the Terminal by pressing the [END] key. Keypad Lockout. If a Valid PIN code is not entered after a number of successive tries (usually 5 or 6), the LCD Terminal will display a “Too many tries” messageand will be totally locked out for a pre-determined period. (Normally 60 seconds)A message “Module Lockout: LCD Term. #? ?” will be logged in the Review memory and an alarm message “Too Many Tries” may be reported. Duress. If you are being forced to perform operations at an LCD Terminal against your will, your system may allow a Duress alarm to be activated by using a special PIN Code. See “Activating a Duress Alarm” for details. PIN discovered. When programming User Codes, if a User attempts to choose aPIN Code that already exists, the message, “This pin not allowed” is displayed. Whenever that PIN Code is now used, the LCD Terminal will display a warning:“Your pin has been discovered by another User. You should change you pin.”If you see this message, you can press [OK] to continue your operation, but make arrangements to have your PIN Code changed as soon as possible. Once you have Logged on to a Terminal, and have seen the Area status with the “Push Off” or “Push On” message, you may perform the Area OFF or ON operations. Remember: You have a limited time to turn an Area OFF once you have entered the Area (Usually 30-90 seconds). Ask the Installer for the Entry time used in your system. After the greeting (if enabled), the display will show the Area Status etc. as before. To select anotherArea see “AREA SELECTION” on the next page. At the “Push OFF” prompt, turn the displayed Area(or Area List) OFF by pressing the [OFF] key.The display will alter accordingly to indicate that the operation was successful. The Display mode can be changed from Single AREA to AREA LIST and vice versa, by pressing the [RIGHT ARROW] key. By using AREA LISTS, you can turn OFF all the Areas in the List that you are allowed to control, with a single operation. i.e. You can select any Area List in the system. However, only Areas that are in the Area List selected and are also in the Area List in your “User Type”, or your “Extra Area” will be turned Off. –AREA / AREA LIST SELECTION. You may select other Areas or Area Lists by using the [UP] and [DOWN] Arrow keys and/or the [DIGIT] keys to select the 1st letter that the Area name begins with. e.g. A system has Areas named “Reception”, “R & D” and “Rodneys Office”. To select any of these Areas, press the [6 PQR] key until an Area starting with “R” is displayed. (You may need to press the key between 1 and 3times depending on other Area names in the system). If the Area that you require is not displayed, use the [DOWN] Arrow key to scroll through, and select, the other Areas starting with that letter. Note: Areas are sorted numerically after the 1st letter. In some applications the system is programmed so that certain User types may only turn the Area Off for a limited time. e.g. A cleaner or guard working outside normal working hours may only turn the Area Off for 60 minute intervals. (V2 or later only). When these User types turn the Area Off, the display shows Area is Off with a “Defer timer” running. At any stage during the defer time, the User can turn the Area Off again, to re-start the timer, (V3 or later only) or turn the Area back On and cancel the timer. When the timer has only 250 seconds left to run,the LCD Terminal will beep every 2 seconds and display this warning. The User can still perform the Area Off or Area On operations during this warning period, but if no action is taken the Area will automatically turn On when the warning period expires. NOTE: If more than one Area is about to turn On,the display shows each Area in turn for 2 seconds. IMPORTANT NOTE: Some systems in high security applications may have the Area Pre-Arm “Walk Test” feature enabled. (Only available in V3 or later). In most systems this feature is not enabled and the Area ON procedure will simply be performed as described below. If Walk Testing is enabled on your system, the same procedure is followed except that after the initial test to ensure that all Zones are Sealed, the system then enters Walk Test mode. After the greeting (if enabled), the display will show the Area Status etc. as before. If you are allowed to control more than one Area, the DISPLAY MODE can be changed and AREA/S SELECTED as described in “Turning Area/s OFF”. At the “Push ON” prompt, turn the displayed Area(or Area List) ON by pressing the [ON] key. After the [ON] key is pressed, the system will test the state of all the inputs allocated to the Area to ensure that they are in the Sealed condition and the Area is ready to be turned ON. If all Zones programmed to be tested are Sealed, the Area will turn ON and this display will indicate that the operation was successful. While this message is displayed, you can press the [ON] key again to view the Exit delay time counting down in 5 second increments. Remember: You have a limited time to exit the Area once you have turned it ON. (Usually 30-90seconds). Ask the Installer for the Exit time used in your system. When the operation is complete the display will return to the Area status message. After pressing the [ON] key, the display may show a message like this. It means that the item displayed is either faulty or in an alarm state, and the Area will not turn ON. e.g. A detector or it’s cabling have been damaged. A door or window has been left open. Try to rectify the problem before trying again. If this is not possible, you may be allowed to ISOLATE the item while the “Zone Problem” message is displayed, by pressing the [OK] key. Inputs isolated in this way are automatically de-isolated when the Area is turned OFF. If a detector or alarm contact is faulty, or their cabling has been shorted or cut, you may be unable to turn ON any Area that the faulty device is in. Users with the authority to “Isolate on Exit” can isolate any faulty devices when prompted during the Area ON procedure. (see “Turning Area/s ON” for details) However, when you know that a device is faulty, (e.g. A roller shutter contact has been damaged by a Forklift) you may also have the authority to Isolate the Zone via this menu option before anyone attempts to turn the Area ON. Note that System Inputs can also be isolated. e.g. “Expander 01 Ext. Siren Tamper”could be isolated while damaged speaker cabling was awaiting repair. NOTE: The Isolate menu also allows you to De-isolate Zones if the fault is rectified before the Area needs to be turned ON. There are two methods of selecting a Zone: “Zone ID” OR “HomeZones”. -Zone ID allows selection of any zone in the system by Zone ID number or by searching through the zone list in numerical order for the zone name. -HomeZones allows selection of any zones that have been designated as HomeZones, by using the quick “Alpha-search” method. (V3 or later only). You will only be able to use one of these methods depending on the setting of the“[H]omeZone Isolate” option in the special options screen of the Menu Group assigned to your User Type. The display will prompt you to enter the Module/Zone (Input) ID of the Zone you wish to isolate. If you know the Zone ID, use the [OFF] key to clear the screen, then enter the letters/numbers of the Zone ID with the [DIGIT] keys, then [OK]. If the ID is not known, press the [ON] key, and then scroll through the Zone names in numerical order using the [UP] and [DOWN] Arrow keys,then [OK]. (Alpha-search using the digit keys is NOT used in this method). The display will show the name and current status of the first HomeZone. (V3 or later only). Press the [DIGIT] key that represents the first letter of the name. (You may have to press the key 2 or 3 times to obtain the required letter.) If the name you want is not displayed because of other names starting with the same letter, use the [DOWN] Arrow key to locate the name, then press the [OK] key to proceed. ISOLATE / DE-ISOLATE THE INPUT. The display will now show the name and current status of the Zone/Input. [OFF] key to Isolate the Zone displayed. Any Zones isolated in this way are automatically De-isolated when the Area is next turned OFF. [ON] key to De-isolate (or “Enable”) the Zone. [RIGHT] arrow key to “Sticky Isolate” the Zone. The Zone will remain isolated unless De-isolated from the LCD Terminal via this Menu option. A brief message will appear on the display to confirm that the operation was successful. When complete press the [OK] key to return to the “Zone to Isolate” display. The LCD Terminal offers a number of options for the Default display.This is the display that will be shown when there are no User operations being performed, and no Alarms or other messages to be displayed. The Default display can be selected separately for each LCD Terminal in your system. The settings can only be programmed by the Installer, who can also advise you on the appropriate options. If no specific Default Display option has been chosen, this message will be displayed. This option allows the name and current status of a single Area to be displayed. This is useful when the Terminal only provides control of one Area. An option is also provided to allow the UP and DOWN Arrow keys to be used to view the name and current status of up to 8 sequential Areas. The Area Array allows the current status of 8 Areas to be viewed by Area number. An option is also provided to allow the UP and DOWN Arrow keys to be used to view the current status of all Areas in the system by Area number. TIME & DATE. (V5 or later only). The Time and Date option allows the current system Time and Date to be displayed. This option is particularly useful if the system is being utilized to generate Time-On-Site reports. Users can be provided with a display of the actual system Date & Time being logged. The Monitoring Station’s Telephone number. “Welcome to (your company name)”-“Enter PIN & OK to Logon”. Four multi purpose lamps are provided across the top of the LCD Terminal for quick and simple indication of Area and Alarm Status, Door functions and/or other conditions. The settings can only be programmed by the Installer, who can also advise you on the appropriate options. Flashing = Alarm in this Area. Users with the appropriate level of authority can perform many other operations and are allowed access to certain programming facilities via the Menu. Now press the [MENU] key. The Menu key can be used at any time to return to the Main menu. The display will now scroll through the list of Menu options that you are allowed to access. There are ten main menu options in the system, numbered from 0 to 9, but User programming will determine which options will be available to each User. Press a [DIGIT] key to select a Menu option. Note: Some options in Sub-menus (e.g. User Codes,Review & Time/Date) require another digit or two to be pressed. The display will show another sub-menu list similar to the one above when required. NOTE: When in the menu, you can return to the Area ON / OFF display by pressing [MENU] , 0. The time and date can be set and adjusted in the “Times” menu. This will be necessary when the system is first commissioned and for daylight saving changes. (This may be done automatically by the system, or in some reporting formats, by the Central Station). The display will show the system’s current date and time. The Date & Time is set in the format: DD/MM/YY-HH:MM The 24 hour clock is used. Use the [DIGIT] keys to enter in the values required and the [RIGHT] Arrow key to move the cursor across the fields. Press [OK] when complete. NOTE: When OK is pressed, the Date & Time is saved AND the seconds count is set to “00”. The display will now allow you to set the weekday. Use the [RIGHT] Arrow key to select the day of the week then press the [OK] key when complete. Press [END] to exit and return to the normal display. Some Users, such as System Administrators, maybe allowed to program/edit “TimeZones”. TimeZones may be used to define when User access to specific functions and items (Areas, Doors, etc) is allowed; and also to provide automated control of items in the system. e.g. Unlock doors during business hours, Operate security lights at night, etc. A TimeZone provides up to 4 separate time periods each programmed with a Start and End time and Days of the week, including Holiday. If “Holiday” is set to Yes when programming the Days, the TimeZone will be allowed to be Valid on Holidays for that time period. The display will allow you to choose a TimeZone to alter, AND will indicate the current status ofthe TimeZone. (V) = Valid. (I) = Invalid. Method i – Select by number. The [DIGIT] keys are used to enter a number OR the [UP] and [DOWN] Arrows will scroll through the numbers. Method ii – Alpha-search. Pressing the [ON] key allows the name of an existing TimeZone to be selected. The [UP] and [DOWN] Arrows will search through the names, OR Press the [DIGIT] key that represents the first letter of the name. (You may have to press the key 2 or 3 times to obtain the required letter.) If the name you want is not displayed because of other names starting with the same letter, use the [DOWN] Arrow key to locate the name. When the desired number or name of the TimeZone is located, press the [OK] key to proceed. The display will show the number and current name. A name of up to 16 characters can be programmed in the same manner as described for User names. [OK] key for next option. [UP] or [DOWN] to edit this option for the previous/next TimeZone. The display will show the current Start Time and End Time of the 1st period. Use the [DIGIT] keys to enter in the values required and the [RIGHT] Arrow key to move the cursor across the fields. The [OFF] key can be used to clear all fields. Press [OK] when complete. [OK] key for next option. [UP] / [DOWN] to edit this option for the previous/next TimeZone. PROGRAM THE DAYS OF THE WEEK. The display will show the current days assignedto the Timezone period. Use the [RIGHT] Arrow key, followed by the  (Yes) &  (No) keys to set the desired options to YES or NO. PROGRAM THE 2nd, 3rd & 4th PERIODS. If you need to program/edit the other TimeZone periods, the [OK] key will step through another 6 screens that allow the Start and End times and the Days of the week to be programmed for these periods in the same way that the 1st period is programmed. To cater for different trading hours on different days. The display will show the current Holiday Types that will be obeyed by this Timezone. The TimeZone will be Invalid on the Holiday types specified unless the “H” option is set to Yesin the “Days of the Week” for a particular period. Use the [RIGHT] Arrow, followed by the (Y) &  (N) keys to set the desired options to YES or NO. [OK] key for next option. [UP] / [DOWN] to edit this option for the previous/next TimeZone. The display will show the current function thatthe Timezone controls. The function (if enabled) will be an option such as “Auxiliary On/Off”,Area On/Off”, “Door Unlock/Lock”, etc. CAUTION: This, and the following related options, are normally only programmed/edited by the Installer. Additional information is provided in the Programmer’s manual. Use the [RIGHT] Arrow key to select the desired function then press [OK]. O On/Secure/Lock/Close when TimeZone goes Valid. F Off/Unsecure/Unlock/Open when TimeZone goes Valid. o On/Secure/Lock/Close when TimeZone goes Invalid. f Off/Unsecure/Unlock/Open when TimeZone goes Invalid. The display will show the current Qualify option settings. The Qualify options allow the TimeZone to be Qualified by an Auxiliary. If this option is used, the TimeZone will only be Valid when a TimeZone Period is Valid AND when the Qualify conditions are met. CAUTION: These options are normally only programmed/edited by the Installer. Use the [RIGHT] Arrow key, followed by the  (Yes) &  (No) keys to set the desired options to YES or NO, then [OK] key for next option. Qualify the TimeZone with an Auxiliary. When Aux. is Off, TimeZone will always be Invalid, regardless of whether any TimeZone Periods are valid. Invert Qualify. Reverse the qualify conditions. When the Aux. is On, TimeZone will always be Invalid, regardless of whether any TimeZone Periods are valid. The display allows the Auxiliary to be chosen that will Qualify the TimeZone. Use the [DIGIT] keys to enter in the Auxiliary ID and the [RIGHT] Arrow key to move the cursor across the fields when necessary.Press [OK] when complete. [OK] key to select another Time Zone to program/edit. [END] key to exit to the normal display. Some Users, such as System Administrators, maybe allowed to program “Holidays”. Holidays are used with TimeZones to define whether a TimeZone will be Invalid or Valid on dates designated as Holidays. A Holiday can be a single date or a period defined with a Start date & an End date. Holidays are defined as Month/Date. No Year is defined, so moveable holidays must be re-programmed every Year. Each Holiday programmed must also be assigned the Holiday “Types” that are to apply to it. In most systems, holidays will not need to be broken down into different types, so all Holidays will be assigned “Type 1” only. In some systems where different types of Holidays are to effect different TimeZones,it will be necessary to divide the Holidays into different types. e.g. Type 1 = Public holidays, Type 2 = School vacations, Type 3 = Summer holiday close down. The display will allow you to choose a Holiday to alter. Method i – Select by number. Use the [DIGIT] keys to enter a number OR [UP] & [DOWN] Arrows to scroll through the numbers. Method ii – Alpha-search. Press the [ON] key to select the name of an existing Holiday. The [UP] and [DOWN] Arrows will search through the names, OR Press the [DIGIT] key that represents the first letter of the name. (You may have to press the key 2 or 3 times to obtain the required letter. )If the name you want is not displayed because of other names starting with the same letter, use the [DOWN] Arrow key to locate the name. When the desired number or name of the Holidayis located, press the [OK] key to proceed. [OK] key for next option. [UP] or [DOWN] to edit this option for the previous/next Holiday. The display will show the current Start Date and End Date of the Holiday. Use the [DIGIT] keys to enter in the dates required and the [RIGHT] Arrow key to move the cursor across the fields when necessary. The [OFF] key can be used to clear all fields. [OK] key for next option. [UP] / [DOWN] to edit this option for the previous/next Holiday. The display will show the current Types assigned to the Holiday. Use the [RIGHT] Arrow, followed by the (Y) & (N) keys to set the desired options to YES or NO. [OK] key to select another Holiday to edit. [UP] / [DOWN] to edit this option for the previous/next Holiday. [END] key to exit to the normal display. NOTE: A Holiday period must be assigned at least one Type. An explanation of Holiday Types is found on the previous page. Some Users, such as System Administrators, maybe allowed to program “Diaries”. Diaries are mainly used to display customised messages on selected LCD Terminals at various selectable times. Diaries can also be used to control an Auxiliary output when required. e.g. For activating a beeper to alert users to the Diary message. Any Diary function can also be Qualified by another Auxiliary, allowing other operations to enable/disable the Diary function if necessary. The display will allow you to choose a Diary toalter. The [DIGIT] keys are used to enter a number OR the [UP]/[DOWN] keys will scroll through the numbers. (Alpha-search not available). When the desired number of the Diary is located, press the [OK] key to proceed. PROGRAM THE DATE AND TIME. The display will show the current settings. Use the [DIGIT] keys to enter in the date & time when the Diary will be valid. The date/time format is DD/MM/YY, HH:MM. Use the [RIGHT] Arrow key to move the cursor across the fields. The [OFF] key can be used to clear all fields before you start, or to set the Diary “Always Valid”. Any blank entry means that field is always valid. e.g. In the example shown, Diary001 will become valid on the 1st of January in any year for 24 hours (any time). [OK] key for next option. [UP]/ [DOWN] to edit this option for the previous/next Diary. The display will show the current Days that the Diary message will be Valid. Use the [RIGHT] Arrow, followed by the (Y) &  (N) keys to set the desired options to YES or NO. [OK] key for next option. [UP] / [DOWN] to edit this option for the previous/next Diary. The display will show the first line of the Diary message. Up to 16 characters of text can be programmed in the same manner as described for User names. NOTE: The first character must not be left blank. [OK] key for next option. [UP] or [DOWN] to edit this option for the previous/next Diary. The display will show the second line of the Diary message. Up to 16 characters of text can be programmed for the 2nd line as described above. CAUTION: The following options should only be programmed by the Installer. The display will show the current Auxiliary output assigned to the Diary. This Auxiliary will turn on when the Diary is valid, and off when invalid. The display will show the current Qualify Auxiliary assigned to the Diary. (V4 or later only) For the Diary to be valid, the Time & Date must be valid and the “Qualify Auxiliary”, if programmed in this screen, must be On. The display will show the current function selected. (V3 or later only) See the table below. Use the [RIGHT] Arrow key to select a function then [OK] to select another Diary to program. Battery Test. When Diary goes Valid, start automatic Battery test cycle. Skip Subtract 1 Hr. Do not select. This option set automatically when necessary. Qualify Aux. (V3 to V3.5 only) Changes the function of the Diary Output Auxiliary to a Qualify Auxiliary. i.e. The Diary will not be Valid unless the specified Auxiliary is On. Your system may be programmed with an option to allow Walk testing of specified Zones in particular Areas. (V3 or later only). Testing simply involves activating the devices (usually detectors) and then allowing them to return to their normal state. e.g. Walk past movement detectors, open and close doors, press then release panic buttons, etc. The system can perform automatic testing on devices that are regularly activated by movement, etc., such as PIRs and Door Contacts. However, other types of Input devices, such as Glass-break, Smoke & Seismic detectors, Panic buttons, Window Contacts, etc. should also be tested on a regular basis. (e.g. Once every month). NOTE: The additional Test Menu options shown in the Menu Flow chart at the rear of this manual are only accessible to the Installer. They provide a comprehensive range of Testing to assist with installation, commissioning and service of the system. The display will prompt you to select an Area to Test. Press the [DIGIT] key that represents the first letter of the name. (You may have to press the key 2 or 3times to obtain the required letter.) If the name you want is not displayed because of other names starting with the same letter, use the [DOWN] Arrow key to locate the name. When the Area is selected, press the [OK] key to proceed. If the maximum time allowed for Walk Testing expires, the test will be aborted and the display will return to the “Area to Test?” prompt. The maximum test time is programmed by the Installer for each Area. If the max. test time for an Area is set to zero, the maximum test time will then be 10 minutes. To abort the Walk Test because a Zone is faulty and cannot be tested, press the [OK] key. A “Test Failed” message will be displayed. Press the [OK] key again to return to the “Area to Test?” prompt. To abort the Walk Test, press the [END] key. The display will briefly show “Operation Aborted”, then return to the “Area to Test?” prompt. To manually advance to the next untested Zone, press any other key. When all the Zones have been tested and there are no faults, the “Test Passed” message is displayed. Push [OK] to exit the Walk Test mode and select another Area to Test. Select another Area to test or Press the [END] key to exit and return to the normal display. Arrange with the Central Monitoring Station for testing to be performed periodically in “real-life” conditions. This involves setting aside a period when all Areas in the system are turned ON, then activating all the Input Devices. A report from theCentral Station is then used to check that all devices activated were reported. This method also tests that Input processing and Reporting options have been programmed appropriately, and that the alarm reporting is occuring effectively. System operation is continuously monitored for problems and special conditions. A “Level Message” is displayed on one or more of the LCD Terminal/s if such a condition exists and will remain on the LCD display until the condition is rectified. * You will probably need the Installer to rectify any of the first 4 conditions. Had Power Problem* 1 or more modules do not have AC power connected. If accessible, check AC power is connected & switched on. Had Battery Problem* One or more modules have low battery voltage. Had Network Problem* One or more modules have stopped communicating with the Control Module. There may be cable damage or a module problem. Had Comms Problem* There is a problem with one or more Comms Tasks. e.g. Central Station, PC, Printer, etc. Alarm reporting may be compromised. Area about to turn On. See “Turning Area/s Off”. Deferred Area Arming Option. Area Name, Enter Code See “Menu Group Options”. [C]ancel Holdup. Log into Panel – Code + OK (Master/Managers Code). Press MENU + 2 + 1 (User Code Menu). Press OK to view User Names. Press ‘DOWN ARROW’ key to find Spare User number. (Or to search by Name Press ON key and enter name). Enter name using numbered keys like creating text message. Use ‘RIGHT ARROW’ key for next field & space, then press OK to move to next programming section. Press ‘RIGHT ARROW’ key to select User Type (Manager/Staff or Owner level) Press OK. Enter desired PIN code & Press OK.
Press END key to exit programming. Press OK to view User Names. Press ‘DOWN ARROW’ key to find desired User to be deleted. (Or to search by Name Press ON key and enter name). Press OFF key to delete name. Press OK to move to next programming section. Press OFF key to delete User Type (Manager/Staff or Owner level) Press OK.
Press OFF key to delete desired PIN code & Press OK.